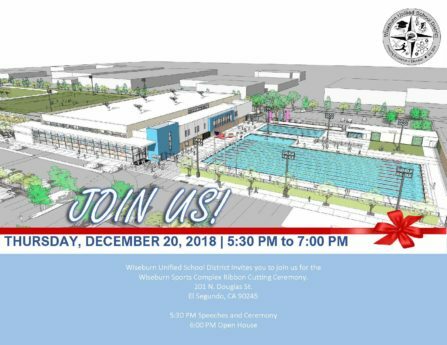 We’re excited to announce that there will be a Ribbon Cutting Ceremony and Open House Celebration at the new Wiseburn Sports Complex on Thursday, December 20. Stop by for a walk-thru and take a look at the new facilities! All families, staff and community members are welcome to attend. The opening of the gym and aquatics center is the culmination of more than eight years of planning and several decades of a long-deferred dream. The new offerings will benefit students and staff, as well as serve as a community resource and landmark for both Wiseburn and City of El Segundo residents. Designed by Gensler, the 48,000 square foot gymnasium will house three full-size basketball courts and three full-sized volleyball courts with a center court for CIF games. The main floor also includes a 1,600 square foot multipurpose room with a roll-up door for CrossFit and weight training, creating fluid transition between indoor and outdoor workout spaces. A Hall of Champions in the main lobby will proudly recognize and celebrate outstanding local athletic excellence. Also on the main floor are a ticket booth, restrooms, and an outdoor shade structure. The second floor of the gymnasium will include another 1,600 sf multipurpose room for dance and yoga and other health and fitness seminars, as well as administrative offices for athletics staff. The City of El Segundo, Department of Recreation and Parks will maintain the pool and run the aquatics programs in a joint-use agreement between the City of El Segundo and the Wiseburn Unified School District. The new facility means Wiseburn-Da Vinci Athletics will be fielding its own swim and water polo teams for the first time. Tryouts start this winter! Students from Da Vinci Communications, Da Vinci Design, and Da Vinci Science all play sports together on one team known as the Wiseburn-Da Vinci Wolves. In addition to new swim and water polo offerings, Wiseburn-Da Vinci Athletics offers a competitive interscholastic athletics program (CIF) for students of all skill levels with 20 teams participating in eight sports, including volleyball, basketball, track, cross country, soccer, softball, baseball, and archery (non-CIF).